← On your mark. Get set. CONFERENCE! Aw, thanks! Technically, who says you have to be there to follow along? I challenge you to come up with a way to play at home! You might even have an easier time getting a selfie with a koala than we will. There IS a way to play at home. Allison, let’s use #NOTatCMNselfie to tag ours 🙂 I might have to photoshop in the paper Pope, though! And it doesn’t have to be THEEEEE Paper Pope, just AAAAAA Paper Pope. I love this idea! I’ve printed up a copy of the blog post so that I can check off my scavenger items (cause I’m nerdy that way.) The game’s afoot! 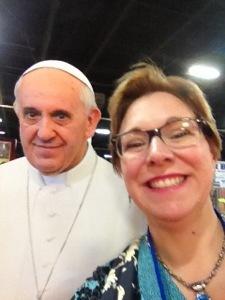 I might even try to collect as many different paper popes as I can. OR multiples of the same pope….